The appointment of new Central Bank chief Elvira Nabiulina sparked debates about the future of Russia's monetary policy and banking system. While some experts are sceptical about Nabiullina's competence others remain optimistic. After Russian President Vladimir Putin appointed Russia’s former economic minister Elvira Nabiullina as the next head of the Central Bank some experts raised their eyebrows on this appointment. Her former post, however, makes some pundits worry that Nabiullina would prioritize growth over stability as Central Bank head. Others believe monetary policy would more or less remain the same. On Tuesday, March 12, President Vladimir Putin officially recommended the former minister of economic development and current presidential adviser, Elvira Nabiullina, as the new head of the Central Bank of Russia. It is believed that Nabiullina will take over in June for Sergei Ignatiev, who has held the position for three years. The appointment had long been the subject of intrigue, with Putin stating only that his choice of candidate would be unexpected. He kept his word: The appearance of a woman on the list of contenders for the post of head of the Central Bank has surprised the market. Whereas some bankers and financiers believe that Ignatiev's course should be continued, others have expressed concern about the Central Bank possibly broadening its strategy in favor of economic growth. 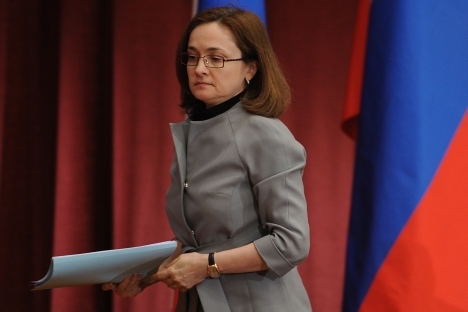 After all, if Elvira Nabiullina's candidacy is approved by the State Duma, she will not only be the first woman in Russian history to head the Central Bank, but also the first person from the Ministry of Economic Development to take up the position. As economics minister, she was primarily occupied with ensuring economic growth. "For the first time, the country's monetary policy and the stability of the banking system – including the ruble – will be in the hands of a person who has always had very different priorities." It is difficult to imagine that Nabiullina will suddenly change her strategy. "Accordingly, if there was a need to continue the previous course, the post would probably go to someone close to or in Ignatiev's team," says Mamontov. According to Mamontov, it is possible that the Central Bank will demand real action to lower the cost of credit, thus ensuring a flow of investments into industry, which has been steadily declining in recent years. If this scenario comes to pass, the Central Bank could revise its previous strategy aimed at reducing the rate of inflation and managing exchange rate policy through lower interest rates, notes Mamontov. This, in turn, would bring some serious personnel changes for Sergei Ignatiev's team. Mamontov's fears are partially confirmed by the initiative of the head of the Federation Council, Valentina Matviyenko, who recently called for a review of the Central Bank's powers and firmer legislation to increase its responsibility for economic growth. Meanwhile, former Finance Minister Alexei Kudrin believes that Nabiullina is a good candidate. He dismisses the idea of any contradiction, since inflation targeting as the main tenet of the Central Bank's monetary policy was approved by the Ministry of Finance and the Ministry of Economic Development. "Ms. Nabiullina will keep to the same principles of the Central Bank, which were approved by the Ministry of Economic Development," Kudrin was quoted by RIA Novosti as saying. Nabiullina's appointment raises another concern: Will the new head of the Central Bank be too dependent on the government and the president? As noted by the head of asset management at Valartis Bank in Geneva, Tim McCartney, Russia's former economics minister is on the same wavelength as the president. "Putin insisted on an easing of monetary policy, and Nabiullina will not find it hard to move in this direction," says McCartney, as cited by Bloomberg. The chairman of the Board of Directors of MDM Bank, Oleg Vyugin – also a potential candidate for the post of head of the Central Bank – counters that Nabiullina belongs to a cohort of managers and civil servants who have been guided all their lives by common sense, not short-term political gain. This means that the Central Bank's policy will remain the same, in his opinion. In the words of Vyugin, this is the most sensible policy in the given circumstances. As for supervision, Vyugin expects evolutionary, rather than revolutionary, changes from the new head – primarily legislative amendments, motivated reasoning, deals with the regulator, and at least a partial solution to the problem of the shadow banking sector. He believes that the government’s approach to tackling the issue is not constructive. Nevertheless, the head of the Russia Banking Association, Anatoly Aksakov, believes that Nabiullina's arrival heralds a few key adjustments. In particular, the Central Bank may draw upon U.S. and European experience of providing long-term refinancing for various projects. Moreover, it could seek to re-purchase mortgage loans or infrastructure bonds, based on the minimum default risk of such instruments.